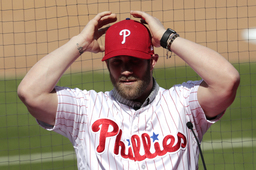 BOSTON (AP) Major League Baseball is investigating whether new Philadelphia slugger Bryce Harper committed a tampering violation when he lobbied for Mike Trout, who isn't a free agent for two more seasons, to join the Phillies. "For me, I can be able to talk to Trout, or whoever it is, big-name free agent or whoever wants to come to Philly or is thinking about coming to Philly, I can say `Hey, this is the place to be," Harper said in the radio interview. "This is where the fans are great, ownership understands it, our manager is awesome."